The second half of this year has been the tyre wars, rather than anything else. Michelin versus Bridgestone, and Michelin are head and shoulders above their Japanese counterpart. In fact, Michael Schumacher is the only Bridgestone runner to feature in the championship standings. The top half of the table is predominantly Michelin, other than the two Ferraris (Rooby Baby is 6th), while the bottom half is totally Bridgestone. There is certainly no parity at this stage. Forget engines, aerodynamic packages and the like. When the bottom half of the grid is Bridgestone and the top half is Michelin, what more evidence do you need? So, with the championship really in the balance, it should come as no surprise that the Bridgestone runners are calling “Foul!” Although the tyre sizes are strictly controlled, it is claimed that the Michelin tyres distort during the race to put more rubber on the road and thereby an inherent advantage in cornering. Expect more wails from the pit walls! With BMW Williams in 2nd and 4th places, it will be interesting to see if Ralf Schumacher will assist Juan Pablo Montoya in his title aspirations. While there is (in theory) no team orders (by order of the FIA) I cannot see Patrick Head or Sir Frank Williams risking losing the world title because of rivalry between his drivers. They have already taken each other off before. They could do it again! Italian GP at Monza this weekend! With only three rounds left in the World Championship, and a singleton point between Michael Schumacher and Montoya, and with Raikkonen one further point behind, it is shaping up for a down to the wire finish. One of the three will be world champ after the US GP and the Japanese close the season. In Thailand, we should have the telecast of the GP at 7 p.m. (I think), but please check your local feed for the time. Also remember that Star Sports is no longer available on some of the cable TV networks. 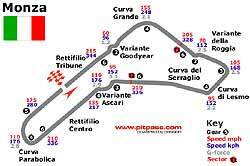 Monza is a track steeped in history, that has hosted the Italian GP almost every year since 1922. Monza and Ferrari are synonymous. The tifosi will turn out by the ten thousand just for testing. The Monza layout has changed over the years, and at one time featured bankings, but these have been discontinued following major concrete defects appearing. The circuit is also one of the fastest on the calendar, and the 1971 Italian GP at the then Monza layout is the fastest F1 GP on record. Unfortunately, the circuit has been altered since then to reduce the speeds, with some revisions to discourage slipstreaming and to lower the average lap speed. Chicanes were added in 1976 and, in 1994, the second Lesmo Bend was tightened and the Curve Grande was reprofiled, but the cars will still be doing 350 kph on pit straight. Last week I asked what style of front suspension would a Morgan 3 wheeler have had? The answer was simple - sliding pillar. By the way, the factory manuals used to say that you should grease the front suspension every 500 miles! So to this week, and it’s a beauty. I received the information from Martin Smith from the Old Speckled Hen Pub, so if it’s wrong - blame him, not me! The pub gets its name from a beer in the UK called The Old Speckled Hen. The beer gets its name from one of the UK’s most famous motoring marques in a very roundabout way. I want to know the car company and how it was involved in conjuring up the name of The Old Speckled Hen beer. Go to it, webcrawlers! The last Citroen test done by our Down-Under correspondent, John Weinthal was on the funky C3. For the wide open roads in Oz, John found it a little underpowered, though it is probably adequate for Thailand’s choked highways. The C5 however, appears to be very different, especially in the 3 litre V6 version. Here are the Words from Weinthal. “The C5’s many differences are all positives. Some cars are eagerly anticipated for all manner of reasons from past experience of the marque to what others have said or written or some notable engineering innovation or sporting achievement. For a long time one approached all Citroen’s expecting the unexpected. Novel and effective technical or styling advances were par for the Citroen course. Citroen’s were different. “Almost always their differences made them better - greater comfort, safer road holding and surprising performance and economy for their engine capacity partly due to unusual attention to aerodynamic detail. “Citroen pioneered mass production front-wheel-drive in the early 1930’s. The agricultural 2CV, first seen in the 1930’s, became a sought-after status mobile in the 1980’s and ’90s. The Light 15 and Big 6 were the signature cars of French art-house movies. The DS 19 ‘Goddess’ of the early ’60s rewrote so many rules that even today it is a standout looker and is recognized as a great technical achievement. “More recently, not all Citroens have come across as particularly original or stimulating. They have been OK, but a bit ordinary - a sort of French Ford or Toyota; nothing special in styling or technology. “The car under review truly marks a return to real Citroen values and interest. It was the C5 Exclusive which costs AUD 57,490 plus the usual on-road costs.. It is Citroen’s largest model with space to rival Commodore and Falcon in spite of its smaller overall footprint. “Like few others these days, Citroen has taken full advantage of its front-wheel-drive layout to maximise interior space and to provide a flat floor to further increase comfort. The C5 is a distinctively styled hatchback. A liftback is unusual among luxury cars but it certainly adds to the car’s many practical attractions. “The test car was the range-topping, leather clad, 157kW 3 litre V6 Exclusive model. The standard transmission is a steptronic-style auto. This is matched perfectly to the free-revving engine, and it is better than most at anticipating the driver’s expectations. “It has a ride that is uncannily flat, thanks to Citroen’s unique hydraulic computer-controlled self-levelling suspension. It is also quiet, quick and agile. “Although the C5 is laden with original features there is nothing which is simply gimmicky. It cossets its passengers, securing them in supremely comfortable leather chairs with height adjustable armrests in the front. There is excellent head and shoulder room and stretching room for legs. “Safety features abound. These start with five three-point seat belts, height-adjustable in front. The front head restraints are tilt and height adjustable. It has anti-lock brakes with electronic brake force distribution and emergency braking assistance which compensates for some driver’s reluctance to brake with full force in an emergency. There is anti-skid control and an electronic stability program. The hazard light activate automatically with sharp braking. “There are six airbags, two in front with two levels of activation, side and curtain airbags extending from front to rear. There are deadlocks, a low tyre pressure indicator, an engine immobiliser, rear parking sensor, a dipping left hand mirror for easier reversing, superb xenon headlamps and automatic headlights and wipers. The windows all have one-touch operation and they close automatically when it rains. There is an electric sunroof, height and reach adjustable steering wheel, climate control air con, cruise control and power adjustment for the front seats, windows and mirrors. A multiscreen monitor includes radio settings, date, time, temperature and service-due indicator. The large carpeted boot has a cargo net to secure loose items. There is storage for the luggage cover when the rear seats are folded forward. This C5 Exclusive is what Citroen’s once were - supremely comfortable, spacious, and distinctively yet practically different. Unlike some European cars it is not different just for the sake of it. The C5’s differences are positives - not perversities. Much the same applies to others in the C5 range - the AUD 43,500, 101 kW 2 litre SX and the AUD 45,750 82 kW 2 litre diesel. The 2 litre C5 is also available as a usefully versatile station wagon from AUD 45,000. “But the C5 V6 Exclusive is my pick of the bunch. Here is the complete modern luxury car. It offers sitting room spaciousness without ever feeling overly large on the road. At around AUD 60,000 there are certainly some interesting alternatives (in Australia) including the Rover 75, Lexus iS200, 2.5 litre Jaguar X-Type and Volvo’s S60 sedan and V70 wagon. Each of these has its special appeal no doubt. Each will satisfy the discerning buyer who is not blinded by the status of a badge.